In its most recent letter to shareholders, Twitter reaffirmed its commitment to creators and influencers as one of the company’s five top priorities in 2016. 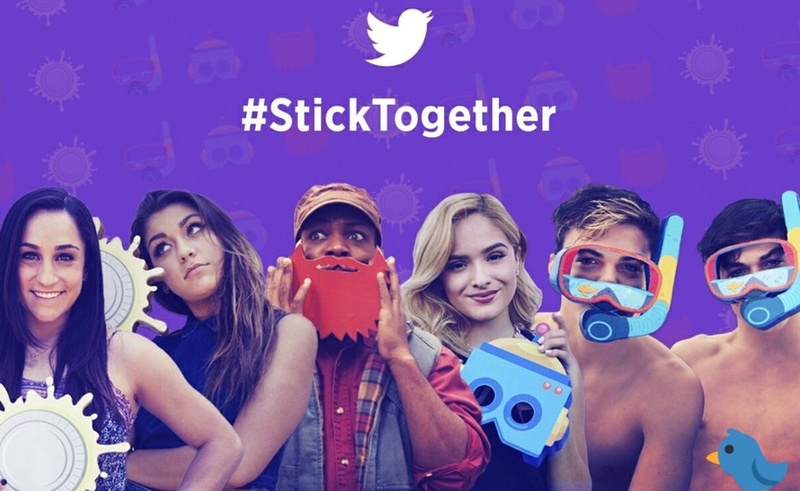 And now, Twitter has tapped a slew of social stars, including The Dolan Twins and Andrea Russett, for a new video ad campaign. The campaign aims to spotlight Stickers, a new feature announced last month and now widely available, which enables users to paste hundreds of cartoon-like images onto their photos. Stickers also serve as visual hashtags of sorts, in that clicking on any given animated image brings up a feed of other photos featuring that same Sticker. The #StickTogether campaign hero spot was produced by digital studio Portal A, which is also behind YouTube’s famed Rewind compilations. Twitter, which says that video uploads have increased by over 50% since the beginning of 2016, has also been increasingly reaching out to influencers over the past year. The company tapped popular YouTuber Connor Franta as the official Twitter partner at the Grammys in February, and also increased its presence at this year’s VidCon gathering. Additionally, the company recently released a standalone app for influencers called Engage, which surfaces the most important follows and mentions from fellow influencers and loyal fans, outlines key stats, and tracks post-by-post performance.